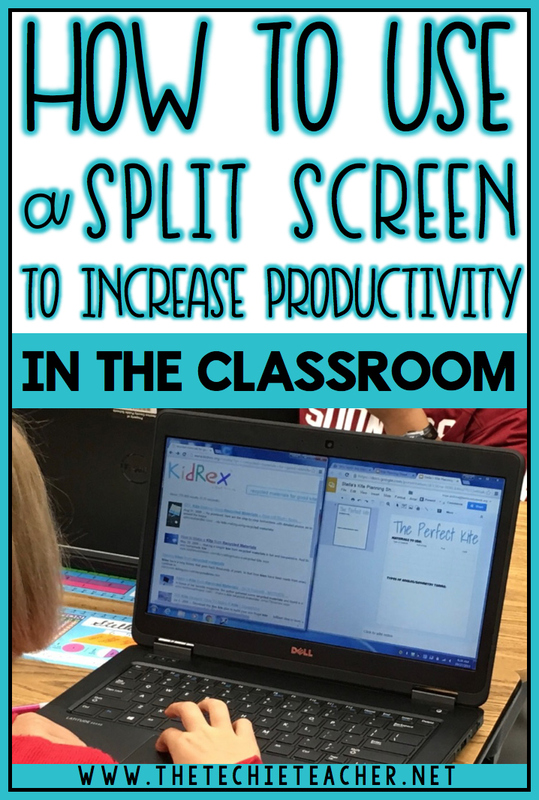 How to Use a Split Screen to Increase Productivity in the Classroom | The Techie Teacher® . Did you know that you can view multiple web pages and/or applications at once on your digital device? 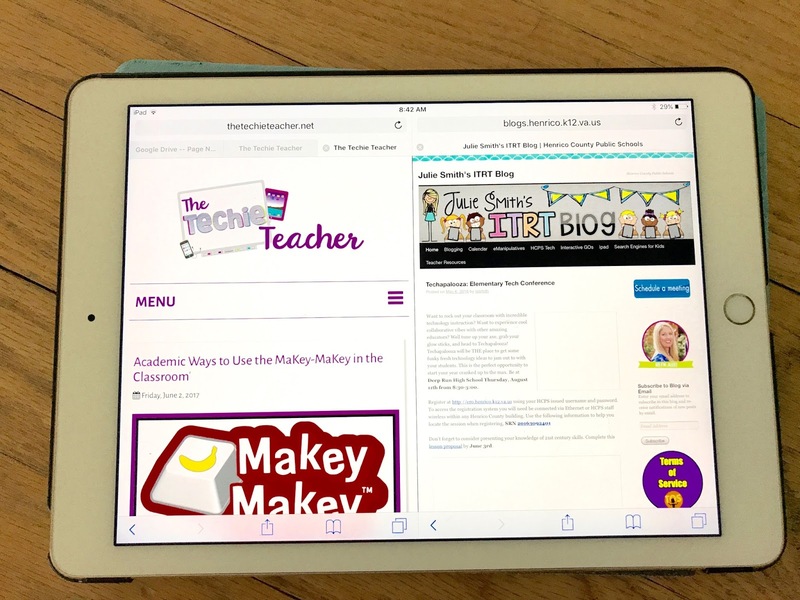 My friend, Jennifer Kimbrell from Tech with Jen, and I were talking the other day about Chrome extensions that make viewing multiple webpages easy for students. I discovered that my "go to" extension, Split Screen, no longer was available and I started to look into other options. Just like everything else involved in the world of ed tech, I am constantly learning something new. Therefore, I wanted to share with you what I discovered last week! The first thing I did was research for a different Chrome Extension™. 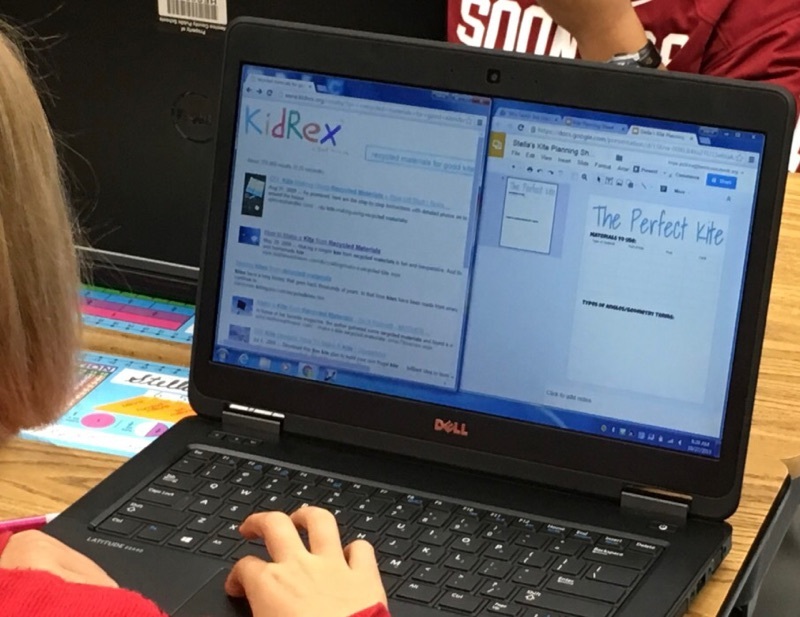 I ended up using Split Tabs with a 3rd grade class and it worked amazingly well. I love how you can select the exact grid layout that works for you. There is a keyboard shortcut to snap your screen to the left or right hand side of a Chromebook. Simply press Alt [ to snap to the left or Alt ] to snap to the right. 👌 Then pull your other tab to the empty side. When using a web-browser or any application, hold down the full screen button in the upper left. As you hold down the green button, your screen will shrink and you can drag it to the left or right hand side of your screen. Release and then you can click another window or application to open on the other side. The district I worked for in Virginia had Dell laptops that ran Windows 7. I really miss those computers for this reason-->you can press the Windows button+the left/right arrow key to snap ANY application to appear on either side of your screen. You could also just drag a window to the far left or right and the Snap feature would put the application in place. Love that! Online Tech Tips provides more information about the PC split screen world in THIS post. I did know about this one but always forget to use it! You have the ability to snap your Safari browser to the left or right hand side of your screen when you are viewing your iPad screen in landscape mode. For now, I believe this only works on iPad Pros, iPad Air 2s and iPad Mini 4s. You can also open two apps to run side by side. Check out the video tutorial HERE. I am not well versed in the Android world but I know people will ask, "What about Android users?". HERE is a post you might find helpful. Why would we want to use a split screen as a teacher and with our students? It is so nice for students to be able to have a web page up next to their note's doc. That way they aren't having to toggle back and forth between tabs while researching. I like using this technique myself! As a teacher, it is nice to have a presentation rolling while having a web tool students are using displayed. 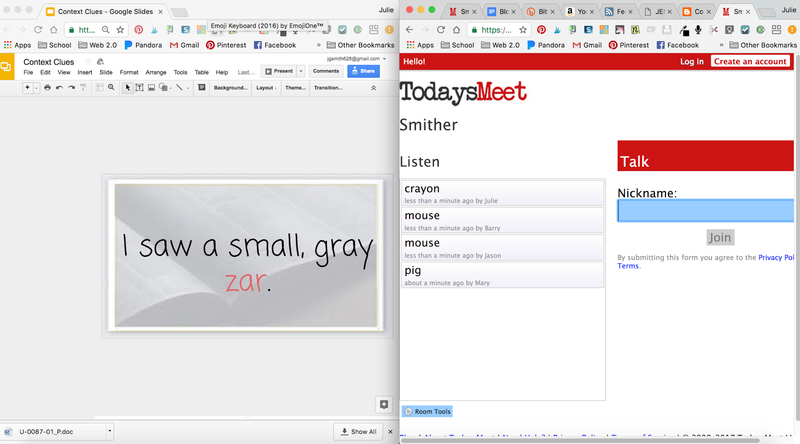 In the picture below you can see a Context Clues game I created in Google Slides™and a Today's Meet chat room opened on the right. Students guess the meaning of the made-up word by typing their answer in the chatroom. *Techie Tip: Since you can't keep a Google Slides presentation in presentation mode with the split screen feature, you can hide the side panel so students can't see your slides by using James Malcolm's Toggle Side Panel bookmarklet. Use a split screen to compare and contrast websites, writing samples, graphs/data, your name it! Hi Jackie! What operating system are you running on your MAC? Also, do you see the blue section when you hold down the green button? Me too! I was able to shrink it to half size, but then could not access my dock to open a new app or browser - In chrome. Hey Lisa! My dock vanishes too. I have both applications open before going into split screen mode. Hopefully they bring back the doc in the next update--would be nice to have access to the dock while in split screen mode. We figured out that your computer has to be running OS El Captain. I am a Mac girl too and had no idea!!! 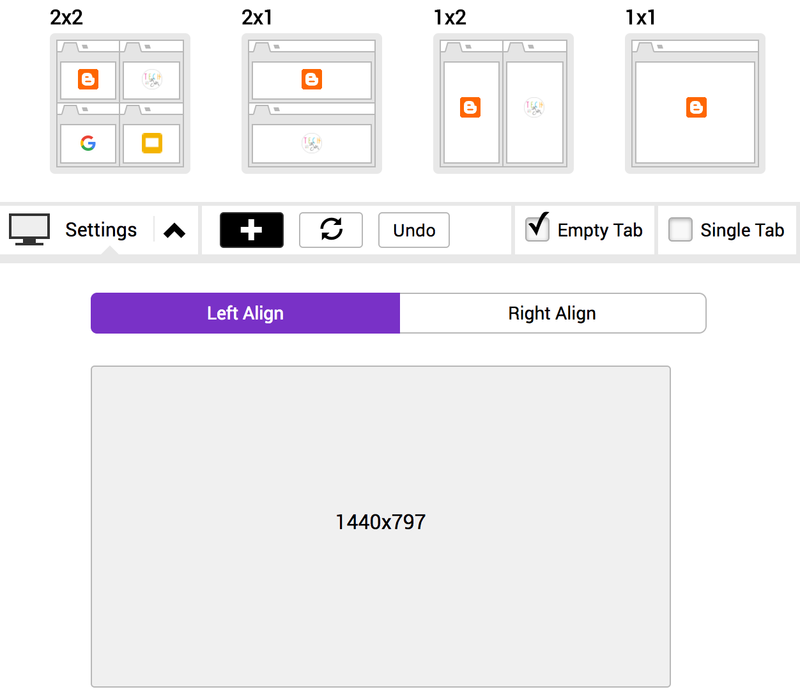 As for the Chromebook, I prefer the Chrome extensions Tab Resize and Tab Glue to split screens and put them back together. I push out both apps to both students. Yes!!! That's a good one too! I learned about those not too long after I wrote this post😂 Thanks for sharing!